Last night was cold. I started with my long underwear on, added my buff as a hat, and even added my town dress halfway through the night. My quilt is rated at 38 degrees but I would never use it anywhere close to there because I think it was only in the 50s last night. I had gone to bed very early and planned to get up very early but every time I woke up, it was still too cold to get out of bed. This is great weather for hiking, bad weather for getting started. When I got going, the first several miles were very easy, so I could have gone farther last night, but I can never tell that ahead of time with these rocks. I made the few miles down to the road quickly and stopped at the Blue Mountain Summit B&B to get some water from their faucet and charge my phone on their porch. My guide said the restaurant opened at 11, and it was just before then, so I decided to wait. Then I noticed their sign said they open at noon. Well it’s real food, so I still waited. I ordered too much, of course, but I gave it my best effort and headed back to the trail overly full. There were several long rock scrambles today, mixed in between the easy road bed parts of the trail. Some of the places they put the blazes on the scrambles made me laugh, they were so ridiculous. Yes, I’ll just go down that very steep, smooth rock without sliding and fly over the abyss at the bottom. Of course. 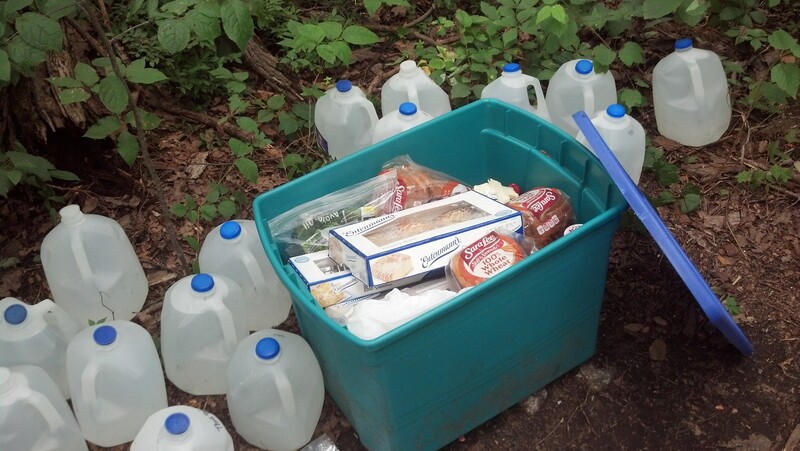 Just as it was getting to dinner time and I’d decided to stop at the next road for a snack, I came upon trail magic! There was a bin full of donuts, cookies, and the makings for peanut butter and jelly sandwiches, surrounded by gallons of water. I had a small dinner there; I never like to take too much so that other hikers will still have plenty. This was on a longer dry stretch of trail so the water was much appreciated too. The final portion of trail for the day took me over the Lehigh Tunnel, which I thought was cool since I’ve spent my whole life driving through it on the way to see family in upstate NY and I was always fascinated by it as a kid. I couldn’t see any part of it from the trail but it was still neat. I arrived at the road to hitch into Palmerton for the night after 17.8 miles. The lady that picked me up lectured me the whole time on the dangers of hitchhiking. I’ve only had to hitch alone a few times and it’s not dangerous because women always pick me up immediately to “save” me. I asked this woman where she was from and when she said Lehighton, I remembered that my friend Amie married a guy from there. When I asked if she knew the Marzens, she did! She even used to live across from their feed store. Small world again! I am staying at the Jailhouse Hostel tonight. The town lets hikers stay in the basement of the borough hall for free but you have to check in with the police, thus the name. Unfortunately it was never a jail. It’s a very large bunkroom though, and there’s a shower in the gym upstairs. I caught up with some hikers I hadn’t seen in a while then cleaned up and walked to the grocery store to grab some real food for dinner. When I was checking out there, the cashier noticed my ziploc wallet and, correctly guessing I’m a hiker, told me I could have a free apple or orange. What a friendly town!